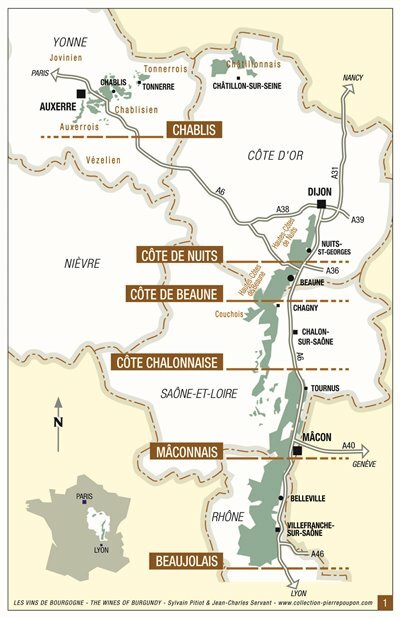 Somewhat to the northwest of the heart of what we think of as Burgundy – that is, the glorious Côte-d’Or with its world-famous Pinot Noir and Chardonnay — lies the appellation of Chablis. Technically, Chablis is part of Burgundy, though it’s more like an island. Or perhaps an unfavored stepchild. But for wine lovers, especially devotees of Chardonnay, Chablis is a discovery-in-waiting. White is the color of Chablis wine, and it is 100 percent Chardonnay. The region’s soil – predominantly limestone, clay and fossilized oyster shells – nourishes seven grand cru vineyards. A large and rather complicated scheme of vineyard designations boils down to about 20 recognized premier crus. There are beauties to be found here, and great bargains. With a group of friends, I recently tasted through examples of basic Chablis, premier cru and grand cru – with bottles of “village” Côte-d’Or whites, one each from Chassagne-Montrachet and Puligny-Montrachet, thrown in for stylistic comparison. It was a bracing reminder of just how rewarding the wines of Chablis can be. Domaine Pattes Loup Chablis Vent d’Ange 2013 ($29). Though this vibrant wine splashed from the bottle with a distinctly vegetal edge on the palate, a few minutes of aeration saw that character transform into pleasing melon flavors supported by crisp acid. The Pattes Loup was poured first, and each time I returned to it, I found a touch more fullness in the body and greater richness on the tongue. Séguinot-Bordet Chablis Premier Cru Fourchaume 2012 ($30). Sometimes there’s just no explaining wine prices. Our tasting group was amused at the $1 step-up in price that produced a substantial gain in finesse. The buttery character of this Séguinot-Bordet Fourchaume anticipated the grand Chassagne-Montrachet to come – but at less than half the price. That’s always the kicker with Chablis: You get rewarding intimations of core Burgundy without the stunning cost. 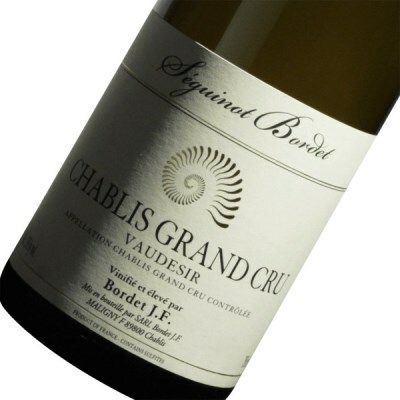 Séguinot-Bordet Chablis Grand Cru Vaudésir 2010 ($58). Honeysuckle and ginger on the nose of this splendid grand cru gave way to an elegant blend of melon and honey on the palate; a good acid frame suggested the wine also has aging potential. And as our group was about to be reminded, $58 these days won’t necessarily get you even a “village” wine from the celebrated Côte de Beaune in Burgundy proper. Vaudésir, by the way, is one of three Chablis grand crus that tend to stand out from the pack, the two others being Valmur and Les Clos. Domaine Amiot Guy et Fils Chassagne-Montrachet Vieilles Vignes 2012 ($72). We were now in a different place, in every sense. Few Chardonnays in the world rival those from Chassagne-Montrachet, Puligny-Montrachet and Meursault, the great triumvirate of communes in the Côte de Beaune at the southern end of Burgundy’s Côte-d’Or, or Golden Slope. But Burgundy prices have soared in recent years, and while this Domaine Amiot Guy et Fils old-vine “village” wine may be a more splendorous cousin of the Séguinot-Bordet Chablis Fourchaume, its virtues come at quite a jump in cost. Hubert Lamy Puligny-Montrachet Les Tremblots Vieilles Vignes 2012 ($78). Here is a frankly amazing example of the sublime Chardonnays that seem to spring from every vineyard in the Côte de Beaune. Despite its modest status as a “village” wine, Hubert Lamy’s Les Tremblots well might be taken for a premier cru, so fine and poised are its texture, weight and fruit-to-acid balance. But such a price for a village wine? It wasn’t so long ago that it would have cost half as much. Which takes us back to the top of this column, and the happy price-quality option of Chablis.